Certainly that’s a loose translation, but the point is that when your opening salvo on an unsuspecting public is to cast the once and future Matt Houston as a guy mucking about some fake medieval world with a clumsy-looking three pronged sword that somehow fires its blades at people, no good is going to come of allowing you within a country mile of a camera ever again. Pyun, who is also credited with being one of the writers, manages to completely muddle even the simplest story elements, such as who is related to who and how. In an effort to be fair, I even went back to parts of the movie to make sure he didn’t explain things after I mentally checked out when I got a gander at how ugly everyone’s wig was, but I still had no idea who these people were. Horsely plays Talon, the son of King Richard who gets killed by the evil Titus Cromwell so that Titus can take over Rich’s kingdom. Talon has several siblings. One older brother is killed. He also had a sister and he may have had a younger brother, but I’m not about go to the instant replay a third time to confirm this. Talon escapes Titus and years later emerges as a great warrior who runs around the various kingdoms with his buddies. He comes back to his dad’s old kingdom right about the time Prince Mikah and Princess Alana are planning their big rebellion to overthrow Titus. Most of that could be overlooked if any of the rest of the movie was any good. The problems though run the gamut, from the off-putting claustrophobic and cheap sets, to the decidedly small scale camera work (there’s a “quickie TV movie, but with some boobies” vibe to it), to the abysmally staged battle scenes, to the annoying attempts of the musical store to sound epic and heroic but only managing to come off as low-grade parody. You’re also going to feel cheated if you come into this thinking that just because the sorcerer is half the title, that he’s going to be half the movie. There’s actually almost no sorcerer action in this movie. 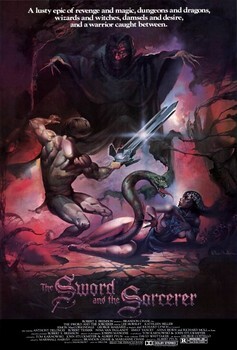 Titus uses a witch to resurrect the sorcerer at the beginning of the film to aid him in defeating King Richard’s armies. 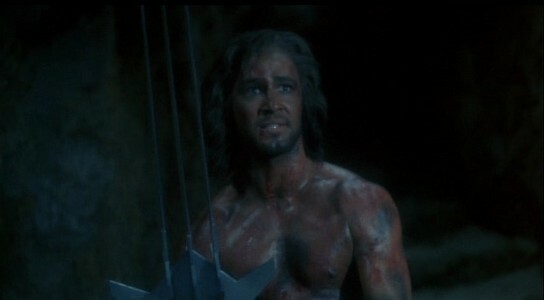 Titus then stabs the sorcerer and throws him off a cliff. The extent of the sorcerer’s remaining activities for most of the movie consist of him assuming a human disguise. I never get why these super powerful creatures craving revenge on the mere mortals who hosed them earlier always seem to spend their time concocting elaborate revenge schemes instead of just using their powers to kill the guy. What was the sorcerer doing pretending to be Titus’ military adviser when he could make his fingers glow and pull someone’s heart from their chest without even touching them? Speaking of pointlessly complicating your life for the sake of dragging the movie out, what was the reason again for Titus forcing Princess Alana to marry him? He was already in control of the kingdom and reviled by all its inhabitants, so it wasn’t going to legitimize his rule. Even though Talon takes on both Titus and the sorcerer in a pair of battles at the end (his only beef with the sorcerer was that both he and the sorcerer wanted to kill Titus), this movie can’t get to the end credits soon enough. Between Talon’s lame three pronged sword, the awful effects employed when the sorcerer gets rid of his human identity (I’ll never criticize computer generated effects again! ), and the sluggish fight between Titus and Talon complete with colored sparks whenever their swords lazily banged into one another, your finger will be anxiously caressing the stop button on your remote control like it was some kind of home video rosary. The one good thing about this movie is that it did generate an honest to goodness scare at the very end of things. Talon had defeated the bad guys, there were some forced cheers for him and then the screen went black and the following spooky words appeared on the screen: “Watch for Talon’s new adventure Tales of the Ancient Empire coming soon.” For 22 long years, the prospect of such a project hung over our heads like a clunky three pronged sword until we were all finally put out of our misery when Albert uleashed Abelar: Tales of an Ancient Empire in 2010! A couple of your “facts” are wrong. First, I never sought work or to be hired. Many of these films came about because I generated them. Second, If I, having no talent, could have a 35 year career, what does it say about all those who had brief or not at all careers? I mean at least I got a chance to make 50 movies and earn a good living. Also, The Sword and the Sorcerer made $39 million dollars (130 million in today’s dollars), Cyborg made over 30 million worldwide. Most of my films have continued to enjoy re-releases and are known in cult circles for whatever reason. I’ve always felt, that those who cannot do review, and those who cannot get a real writing position, write on the internet. Your success in your chosen profession was never questioned, but profitability doesn’t necessarily correlate to quality. But beyond that, look around the site – it’s full of over the top hyperbole on all sorts of movies and performers. That’s part of the site’s gimmick. And I’m one of the few guys who stood up for you on your Captain America movie! Besides, the man behind the Nemesis quadrilogy doesn’t have to defend himself to anyone! While I appreciate you standing up for Captain America (director’s cut I hope), it still important that all the films I’ve done (except one) have been financial successes and that’s the reason I’ve been given the opportunity to make so many. Since I was a kid growing up in Hawaii, all I’ve wanted to do was make movies. I’ve been lucky and blessed to have had the opportunity. I never expected to make more than one or two feature films, that i’ve made more than 50 is as much of a surprise to me and, I reckon, you. I agree financial success does not mean quality except that the films have gained worldwide support and fans. So, thats maybe why I can continue to make films? Instead of implying I should not be hired. I’ve the companies and producers (except one) a lot of money. My films have earned collectively over 200 million dollars. Maybe that’s why I given the opportunity to make movies. I am not clever enough to create a blog site, but maybe I should where I reviews that are written. That might be needed. Except I will use my real name to author it. The reason I’m a whipping boy on the internet is because I’m an easy target. And its a tiring repetitive approach. Anyway, good luck on your site. Someday I hope you can use your real name and spend more time in critical analysis of a movie instead trying to take clever cheap shots at the expense of a movie. It ain’t funny .